I love everything about Greece: the idyllic beaches, great weather, countless islands, healthy and delicious food, hospitable people, beautiful language, authentic villages and diverse and breathtaking landscapes. The country has faced quite a few problems those last few years but the tourists kept coming. Some destinations are absolutely overcrowded while others are so very calm. Santorini for example is incredibly crowded while Ikaria still radiates quiet and authenticity. Or what about Thessaloniki and towns like Kavala in the north which are so much less touristic than the towns in the south. There are still hidden gems to be discovered in this gorgeous country. Good thing as there are some lovely hotels out there. These are the 10 on my list, let me know your fav in the comments below! 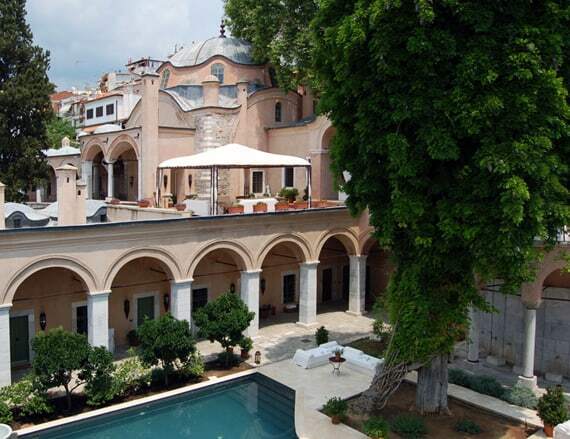 The Imaret is a historic building from 1817, built at the time for Mohamed ali Pacha. Thanks to the pale pink façade, the many domes and the beautiful details of Ottoman architecture, the Imaret is one of the most impressive buildings in the region. The hotel is part of the Small Luxury Hotels of the World. It is very chic and intimate with only 27 rooms. The location is perfect, within walking distance of the port and anything you would want to visit in Kavala. In this hotel, which is part of ‘Relais & Chateaux’, privacy is of great importance. You hardly notice the staff, but if you need anything, they are there. The luxurious five-star resort is located on the beach and has a fantastic saltwater swimming pool. There are rooms in the main building and some more secluded bungalows, some even with a private swimming pool. It’s all about harmony and tranquility out here, especially when you walk through the stunning gardens. The view of the bay of Mirabello is absolutely gorgeous. I do not like the name Four Seasons, I somehow make the association with an impersonal business hotel – part of some hotel chain – but hotel Varosi is exactly the opposite! The name does not do justice to this special boutique hotel. The Varosi district is the oldest district of Edessa, pittoresque with old houses in beautiful soft colors. The hotel Varosi Four Seasons is ideally located in the middle of this neighborhood near the famous waterfalls and also within walking distance of the modern city center. It is not a luxury hotel with fitness rooms and swimming pools but you will be pampered nevertheless in tastefully decorated rooms and the approach of the hostesses is personal and attentive. The hotel was an old typical Varosi house, with a beautiful view of the valley, which the female owners have renovated with great care and with the help of family, while trying to retain the traditional character. The key words here are intimate, comfort, excellent service. The multi-awarded 5 star Grande Bretagne hotel is the oldest hotel in Athens and also one of the most luxurious. It was built in 1842. In 1930, a wing was added and in 1956 an additional four floors were added on top of that. The building is enormous, there are 320 rooms and suites. In terms of location, it couldn’t be more central – it’s right in the heart of town with a view of Syntagma square and the Parthenon. During the Second World War, when Athens came into the hands of the Nazis, Hotel Grande Bretagne became the headquarters of the Third Reich. The hotel was inhabited by hundreds of officers for three years. The hotel reopened its doors in 1956. It became the iconic hotel is was – once again. A hotel where celebrities love to stay (David Bowie, Maria Callas, Brigitte Bardot, Sophia Loren, to name a few). The hotel has had major renovation in 2003 and is now back in its full glory. For those who are insensitive to the old-world charm of the Grande Bretagne hotel, there is another wonderful hotel in Athens (close to the airport). The Semiramis hotel is modern, artsy and colorful. The playful design hotel has 51 rooms, including four roof suites and five bungalows. Visionary designer Karim Rachid, well-known for his flowing shapes and use of color, is responsible for the creative design. He has designed everything in the hotel, from the staff’s clothing to the soap bottles, so every little detail is right. It all fits. The Semiramis, with lime green, orange and yellow accents, is truly a work of art in itself. Alexander and Aris Kyrimai have renovated several old stone houses from 1870 and converted them into an authentic hotel. These houses used to form a trade center. The historic hotel is located on the seafront and offers all the modern comfort in a traditional setting. It looks like a mini village in the village. This hotel is perfect for those who want to get away from it all. Here you will find peace and quiet in wonderful surroundings. When it is very hot it stays nice and cool in the rooms thanks to the thick stone walls. For the cold days, choose the rooms with a fireplace. Mani is a superb region with few tourists. I would totally live here if it was possible. This luxury resort can be found on the beach at Vourvourou bay. The style of the 65 rooms is a combination of modern and traditional, a combination of Greek and Feng Shui elements and lots of white. With three restaurants and two bars there is always something to eat and drink: great because that’s exactly what you should do at Ekies All Senses. This is a hotel where you come to relax (they even have a hammock in the sea, you get the picture). Eat, drink, lie on the beach, swim in the pool, everything’s here for a peaceful holiday. You can rent a speedboat or canoe and get active if you want. You could also discover Sithonia by car. It is a beautiful unspoiled region. This is a small hotel in a historic building in one of the famous Zagori villages. The hotel has 15 rooms and suites, and a very good restaurant. The landscape in the area is beyond words and you’ll have stunning views of the Timfi mountains and the Vikos gorge from the hotel. Mikro Papigo 1700 has been furnished with great care and has all the luxury you’ll need. The classical authentic details have been preserved as much as possible and have been mixed with the work of the most progressive architects. The hotel is one of the first “green” hotels (if not the first) in the region. The hotel is located at the highest point of the village which means that you have to walk up and down a lot as cars are not allowed there. The hotel does have special trolleys to help with suitcases for instance. If you’re wondering about the name: the hotel is named after the year in which the oldest house in the village was built. Serene peace! The owner of hotel Cavo Tagoo is an architect himself and that is certainly reflected in the design. It is a combination of minimalism, Greek tradition and natural elements. Lots of white with elegant golden accents. They used natural elements, it’s gorgeous, it looks very pure. The hotel is located on a rock with panoramic sea views. The rooms offer all amenities of a luxury hotel and some rooms have private swimming pools. Hotel On the Rocks in Santorini is literally carved into the rocks of Imerovigli. The hotel has a dazzling view of the deep blue sea and the Caldera volcano. The decor is modern and fresh, in perfect harmony with the location. 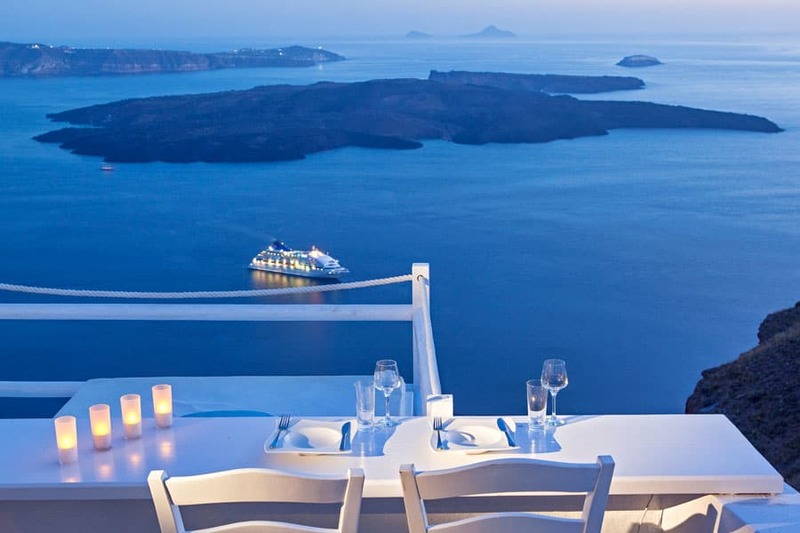 Tell me, what’s your favorite hotel in Greece? Wat een heerlijke locaties. Zo krijg je extra zin in de zomer! OMG, ze zijn allemaal mooi zeg. maar wat wil je ook, in griekenland. Dat uitzicht, de zon, de sfeer. Mooie hotels! Griekenland staat heel hoog op mijn go to lijstje. wauw, wauw, wauw, ik wil op vakantie, wat een mooie plekken, stuk voor stuk. Dit geeft pas echt dat vakantie gevoel. op en top! ohhh wauw, het is daar al mooi, maar op zulke locaties is het nog extra genieten. Wauw wat een pareltjes zeg. Verder dan Chersonissos ben ik nog niet gekomen dus er is nog genoeg moois te ontdekken! Oh wauw, ze zien er stuk voor stuk allemaal prachtig uit! Wat een geweldige hotels! Ik ben ooit naar Rhodos geweest maar heb daarna Griekenland niet meer bezocht. Een goede reminder om dat verder te verkennen.